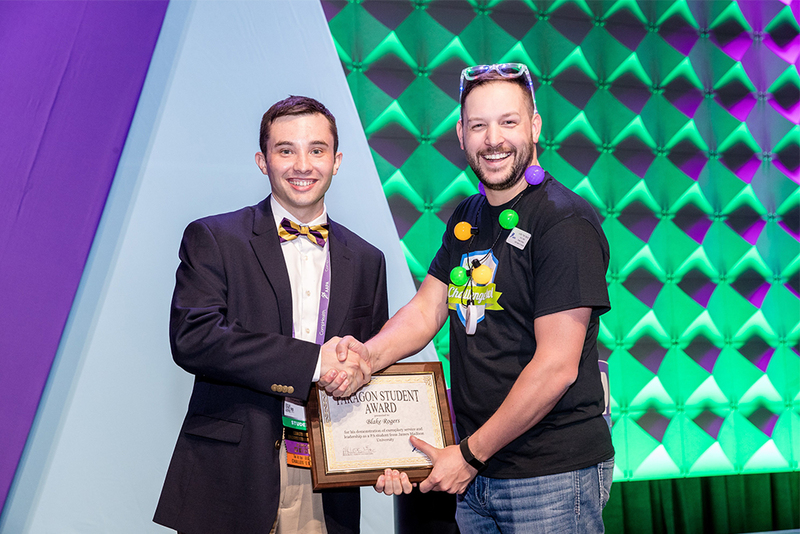 Blake Rogers was honored by the American Association of Physician Assistants (AAPA) with the PA Student of the Year Award. A 2014 graduate of Eastern Mennonite University, Rogers is in the physician assistant program at James Madison University (JMU). He accepted the award May 20 at the AAPA National Medical Challenge Bowl competition in New Orleans, Louisiana. The PA Student of the Year award recognizes “an individual who has demonstrated a commitment to exemplary service, advocacy and leadership to the PA profession,” according to a press release issued by AAPA. Read about Blake’s community service with the Clover Hill Fire Department and his work after graduation with the Soil and Water Conservation Board. During PA Week in 2017, Rogers volunteered to lead formal presentations at four of Harrisonburg’s high schools promoting the PA profession. His presentations reached more than 100 students, most of whom had never heard of the PA career. Rogers also encouraged his fellow PA students at JMU to attend the Virginia Academy of PAs’ (VAPA) conference. He reserved hotel rooms, coordinated a quiz-bowl team, and organized a carpool. The 2017 VAPA conference had the highest number of student attendees in recent years, due in large part to Rogers’s efforts. Rogers served as the student representative on the VAPA Board, and organized a social media campaign that ultimately increased VAPA’s social media followers by 200 percent. Rogers chairs the social media committee, which is responsible for their Facebook page, Twitter account and quarterly newsletter. He is the only student to have been selected to chair a VAPA committee. Rogers “not only exemplifies the core tenets of a healthcare provider, but he is an incredible citizen, leader and friend,” said VAPA President Amanda Collins, PA-C. In addition to pursuing his PA degree, Blake is also a member of the local emergency services and has been a volunteer instructor for EMS services. His hobbies include beekeeping, hiking and growing pumpkins. While a double-major at EMU in biology and environmental sciences, Rogers volunteered with the Clover Hill Volunteer Fire Department. He also interned with the Shenandoah Valley Soil and Water Conservation District and accepted a job there after graduation.